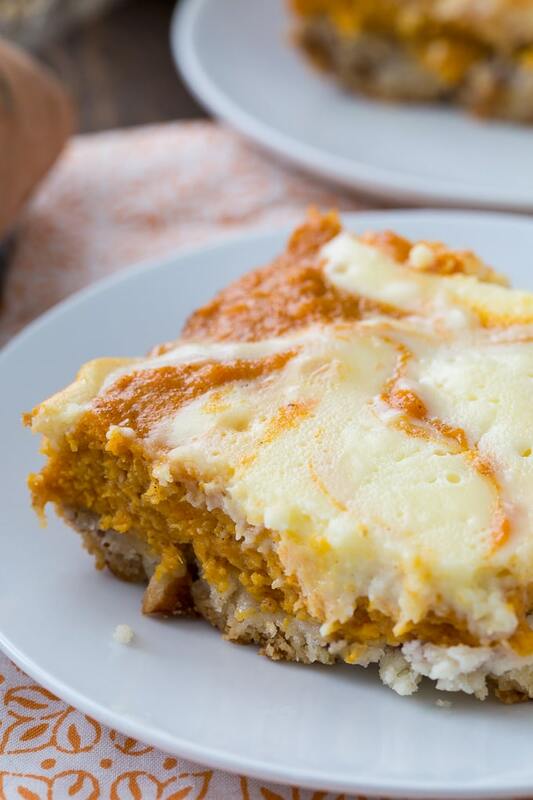 Sweet Potato Cream Cheese Bars are perfectly flavored for fall. The flavor of sweet potatoes, pecans, and fall spices really shine through in these creamy, rich and buttery bars. On the bottom is a crust made from 3 ingredients: cake mix, chopped toasted pecans, and butter. This mixture gets pressed into the bottom of a 9×13-inch baking dish. The top layer is two layers swirled together. 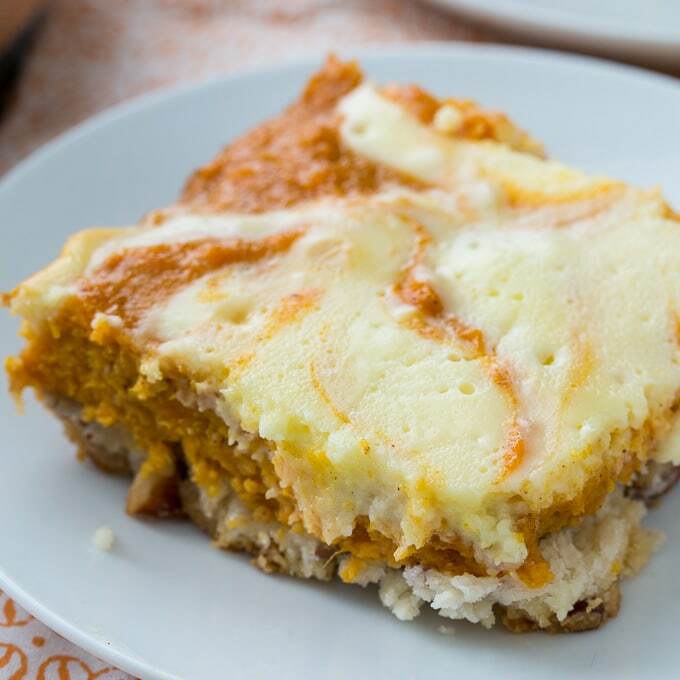 A creamy cream cheese layer and a sweet potato layer made with a full 3 cups of mashed sweet potato, 2 eggs, sweetened condensed milk, pumpkin pie spice, and vanilla extract. Sweet Potato Cream Cheese Bars are baked for 45 minutes and then they need to be refrigerated for at least 4 hours before slicing. Bake the sweet potatoes for 1 hour at 400 degrees. Let them cool slightly and then peel the skins off and discard. Mash them well with a fork. Be sure to use cream cheese that is very softened or at room temperature or it will be difficult to get a smooth mixture. 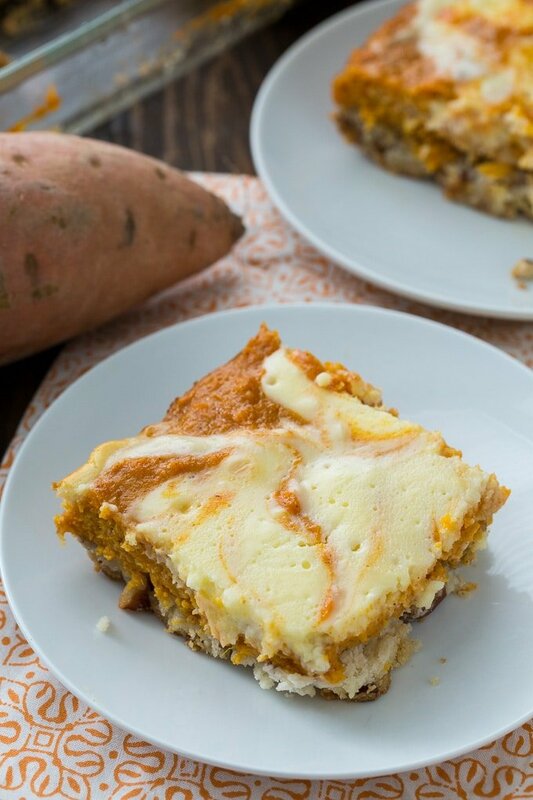 Sweet Potato Cream Cheese Bars are perfectly flavored for fall. The flavor of sweet potatoes, pecans, and fall spices shine through in these rich, buttery bars. In a large bowl, combine dry cake mix and pecans. Cut in butter with a pastry blender or your fingers. Press mixture into bottom of prepared pan. Using an electric stand or hand mixer, beat cream cheese, sugar, 1 egg, and 2 tablespoons of sweetened condensed milk until smooth. Set aside. 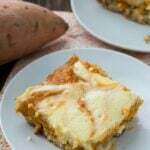 In a clean bowl, stir together sweet potatoes, remaining 2 eggs, remaining sweetened condensed milk, pumpkin pie spice, and vanilla extract. Pour mixture over pecan/cake mixture. Drop cream cheese mixture by spoonfuls over sweet potato mixture. Cut through the cream cheese with a knife to swirl the 2 layers together. Bake until set, about 45 minutes. Cool completely and then refrigerate for at least 4 hours before cutting into squares and serving. This entry was posted in Brownies and Bars, Desserts and tagged sweet potato, sweet potatoes. Bookmark the permalink.